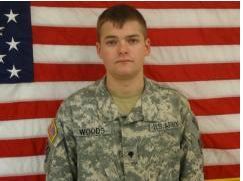 Army Specialist Matthew R. Woods - Run for the Fallen New Hampshire, Inc.
Matthew was born at Littleton Regional Hospital, the youngest son of Michael and Rena Woods. He was a graduate of Lisbon Regional High School class of 2007. He participated in varsity soccer, basketball, and baseball teams, receiving championships in each sport. His high school teachers and friends remember him fondly and remember him for his determination and hard work. Matt loved the outdoors and enjoyed ice fishing, hunting, hiking, camping and spending time with family and friends. His favorite motto was “Live, Love and Ice Fish.” He worked for Fall Line Painting before joining the Army in Jan. 2009. Family remembers Matt as an amazing son, who was loved and respected by many. They are proud of him for serving his country and for his accomplishments.Matt attended basic training at Fort Knox, Ky. He was assigned to Bravo Troop 3rd Squadron 1st US Calvary 3rd Heavy Brigade Combat Team, 3rd ID, Fort Benning, Georgia in May 2009. He served his country doing a tour in Iraq from Oct. 2009 to Sept. 2010. His awards and decorations include the Army Achievement Medal, Meritorious Unit Commendation, National Defense Service Medal, Iraqi Campaign Medal-Campaign Stars, Army Service Ribbon, Recipient of Drivers Badge with a wheel, and Expert Rifleman's Badge. Matthew is survived by his parents Michael (Woody) and Rena Woods, brother Michael Woods and companion Brenda Fairbrother, and his extended family.